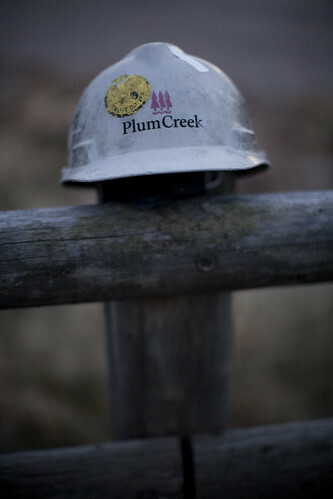 When the Plum Creek lumber mill closed, the workers hung up their white hard hats for the last time. But they didn’t hang them in their lockers as they had for years. 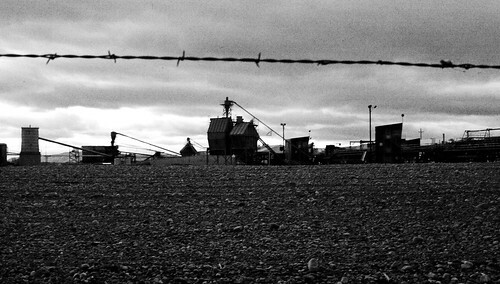 They put them outside on the fence posts that circled the mill, where people could see them. The mill closed four months ago, but dozens of the hard hats still sit atop the wooden fence. They are dirty and scratched, and the Plum Creek logo has worn away on most. On one, the name “Rick” is written in faded red marker. Many are plastered in safety stickers, some dating back to a decade ago. It’s quiet, empty of the logs and people that once crowded its vast lots. Now, only puddles and unused buildings remain. Partly due to competition from Canadian lumber mills, the Pablo, Mont., mill closed after being in business for more than four decades. Approximately 80 people were laid off, forcing some to walk away from the only job they had ever had. However, because foreign imports played a role in the mill’s closure, the workers are eligible for up to three years of free schooling under the government’s Trade Adjustment Assistance program – an opportunity many are seizing. Ellen Kaphammer, who worked at the mill for 21 years, says losing her job was almost like a blessing in disguise. It allowed her to go to nursing school, something she always wanted to do. Kaphammer, 54, has never been to college, so it’ll take her four years to become a registered nurse – she and her husband will pay for the last year. “I always try to make the best out of every situation,” she says. It’s a Saturday afternoon, and Kaphammer has just gotten home from a care clinic in Ronan, where she works as a nursing assistant. She’s still wearing her work clothes – tightly laced tennis shoes and blue flowery scrubs. Kaphammer, who’s taking classes from Salish Kootenai College, would like to find a job close to Ronan when she’s done with school so she and her husband Karl don’t have to move. Whatever job she finds, though, she knows she won’t make as much money or receive as many benefits as she did before. The jobs at the mill were the best in the valley, and everybody knew it. She still remembers the day she found out the mill would close. “The bosses called a mandatory meeting, which is never good,” she says. It was the end of April, months after other lumber mills in the area had closed and the Pablo mill workers thought they were safe. So when managers announced their mill would close, not just temporarily, but forever, the workers were shocked. “You could’ve heard a pin drop,” says Kayo Reynolds, a former electrician at the mill, describing the moment managers announced the closure. He remembers the two months after that, as he and his co-workers tried to motivate themselves, knowing that their work would soon be meaningless. 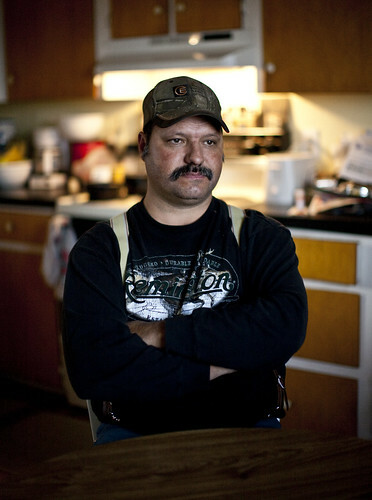 Unlike Kaphammer, Kayo, 47, is still charting his post-Plum Creek life. He plans on taking online classes in the spring, but he’s not sure yet what he’ll study. In the meantime, he’ll just try to stay busy. The Reynolds live in a white farmhouse outside of town, where cattails are their closest neighbors. Behind the house is a new shed that Kayo built, and freshly chopped firewood is piled on the back stoop. Inside, Kayo’s wife Yvette stirs their supper on the stovetop. Kayo sits at the kitchen table, talking about the remodeling he’s been doing. He’s re-wired and re-plumbed the whole house, and has a list of projects he hasn’t started. Their kitchen window frames a landscape they see every day. The sun shines through gaps in the clouds, illuminating the dark blue of the Mission mountains. Round bales of hay are stacked in the foreground and a single horse stands nearby. Along with the beauty salon that Yvette owns, the Reynolds have a ranch with 25 cows and 20 horses. They wanted to live on a ranch because they thought it would be the best way to raise their kids. Their two sons now work as hired hands in central Montana. “They won’t get rich, but they’ll have a good lifestyle,” Yvette says. And it's that lifestyle he worries he may lose because of the mill's closing. Kayo says he may have to move to a larger city to find work, but he’ll do all he can to avoid that. And while he’s without a job, he thinks they’ll be okay, as long as Yvette keeps cutting hair and he can sell a cow or two. “We’re just gonna try to hold ‘er together and see what happens,” he said. Kayo isn’t so much worried about himself as he is about some of his co-workers, especially the younger ones. They’re the ones that needed their jobs the most, the ones who still have mortgages to pay and kids to feed. Then there are the older workers who were laid off soon before they would have retired. Now they must decide if they will retire early or learn new skills for a job they’d only have for a few years. In more rural parts of the country, the economic recession that has driven unemployment into double digits has not hit as hard. But that is cold comfort for Lake County, Mont. where the unemployment rate has climbed from 5.5 percent in April of 2008 to 8.3 percent in September of this year. And in these smaller communities, a closure like Plum Creek ripples throughout the area. The mill used to pay $300,000 a month for the electric bill, money that will now be lost. The schools and the state will also lose the tax money the mill brought in. Some people will inevitably have to move from Ronan to find jobs, or travel a good distance to work. There’s still gossip around town that somebody’s going to buy the mill and start it up again, but that possibility seems more like a desperate hope than a likelihood. Most have turned their hopes to school, but even so, they wonder if a degree will be of any help in getting them a job. Until then, they’ll live off the half-paychecks that unemployment brings them, studying, searching for jobs, and biding time. And every now and then, when they drive from Ronan to Pablo, they’ll pass by the old mill and marvel at how still it is. Kayo used to drive by and see lights out and know he’d have to go make them work again. The mill is almost completely dark now, and when Kayo drives by, he knows he can’t fix it. The mill’s mint green and faded white buildings stand alone on empty dirt fields. There are no bustling people, no logs and no jobs. All that’s left is a row of abandoned white hard hats. Hey, know About Lucas Till biography? Visit Our page or Secrets Of Lucas Till! Do You Know?